I'm around! These kids, man, who knew they took up so much time? 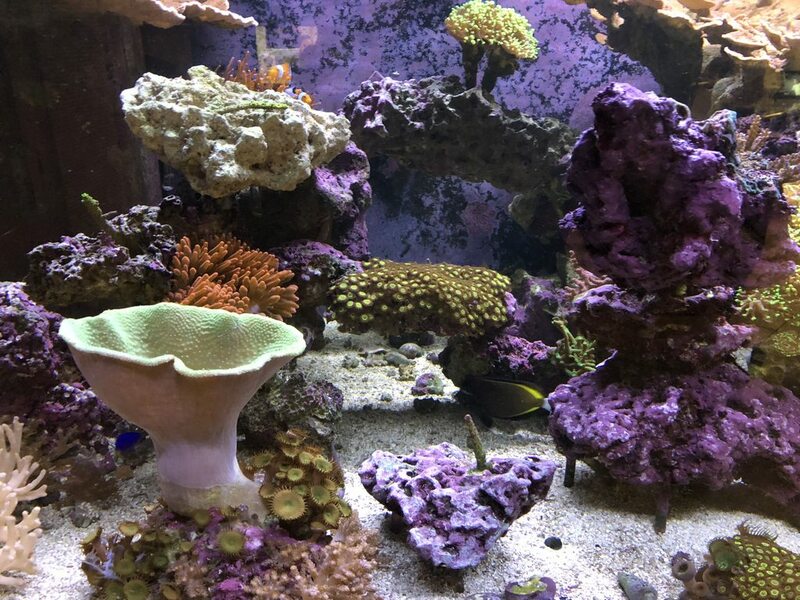 I've still got the tank running, fish are doing great, corals are ok, but algae... man, algae is thriving. I'm pretty impressed with my ability to grow some algae. I actually spent yesterday siphoning a bunch out. What I want to have occur, in my abundance of laziness, is to have the mangrove trees take up all the nutrients and never have to do anything else to cull algae again, but that's going to take some time. 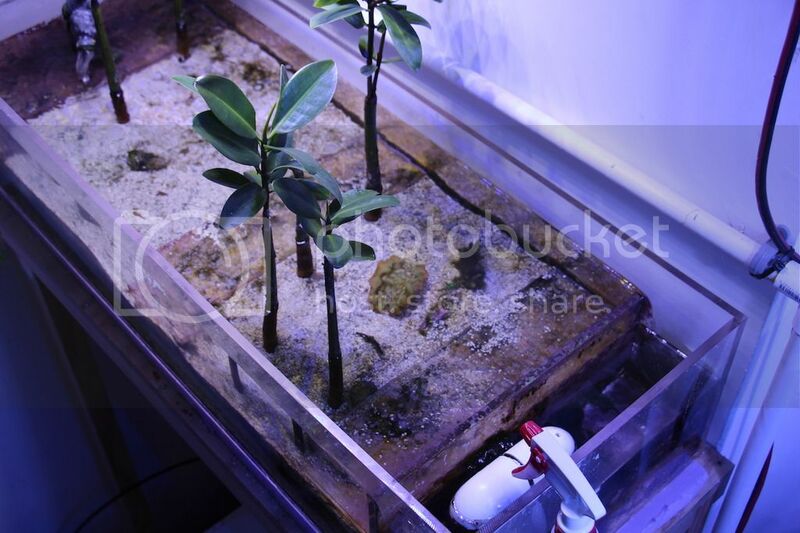 I have 9 red mangroves that are sprouting leaves, but they're not large enough to be my sole nutrient export. I've also boosted my magnesium levels in an attempt to help stymie some of the growth, but that's not really helped in the last month (it was low, around 1000ppm, so I brought it up to a bit over 1500ppm, which is on the high side but no negative effects have I seen thus far). In other words, I've been ignoring maintenance and it's caught up to me. I'd like to pull the rocks out and start over, but that's a lot of work. And cost. I probably will start pulling some out just to get better water movement in the tank. I also replaced two of my old Tunze 6100s (as in, first generation) with two of the Maxspect 150 gyres. I like those. I still enjoy having the tank, the kids (now almost 4 and 7) like to help out, and I don't mind the algae to be honest. I do need to get back into good habits with maintenance, but I don't think I'll do anything drastic. I had a LOT better success in my aquariuming when I was barebottom (no sand bed, cutting board on the bottom of the tank), as it lends itself better to the laziness I'm so good at, but I'm unconvinced I want to go back to that. Though it could happen. I'll try to get some imagery up in the next week or so. I'm proud to show off my algae success. Here are a few pictures as promised. I took them this morning under just the LEDs (no MH on), and you can see the light bleedthrough on the right side of this image from the lights I use over the mangroves. 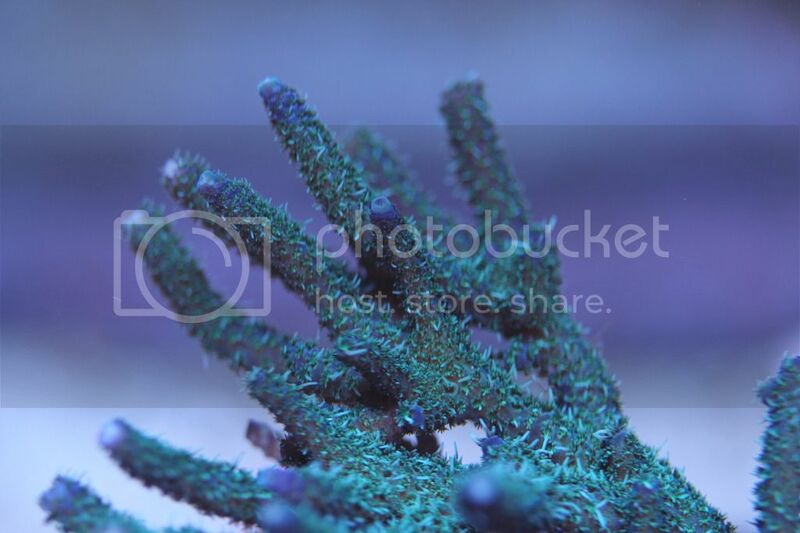 A close up shot of the vlagmini tang and algae in the birdsnest. Last edited by crvz; 05/15/2018 at 03:03 PM. Proof of life. The colors are weird as its just the LEDs on, and the production value is incredibly low. But hey, this was from today! Everything is still in operation. The sump sprung a leak a few months ago, but that was a pretty easy fix (just a bit of time to pull it out). 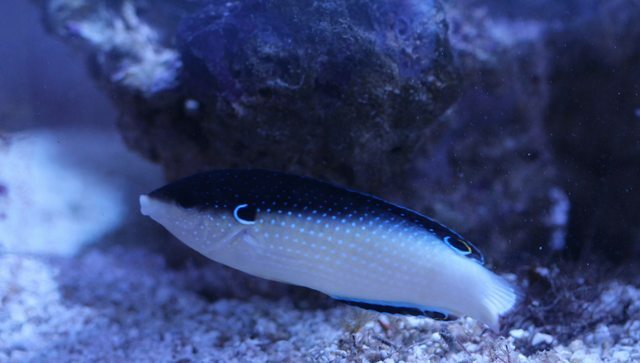 I got a few new fish, and lost a few others. 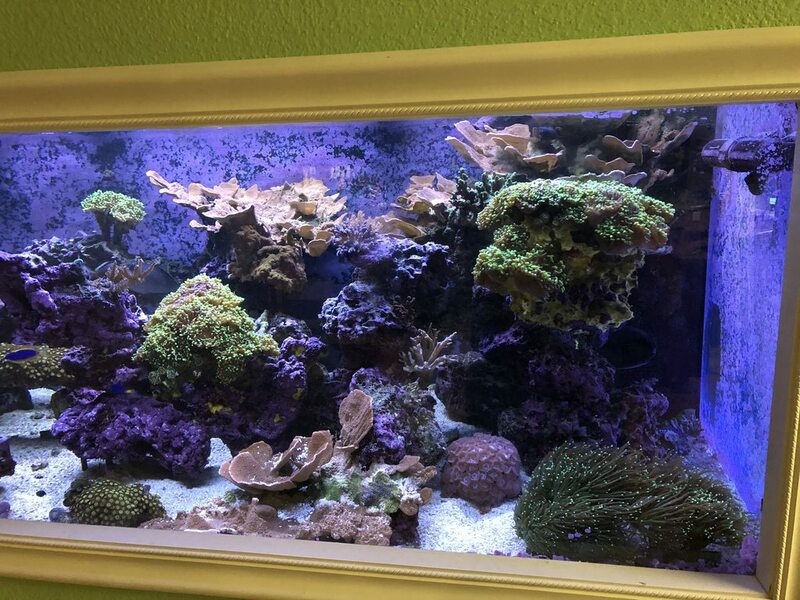 Algae grows too easily, and most of my hardware is nearing 7 years of age, so I'm starting to have to replace bits and pieces (float switches, solenoids, LEDs, etc.). I like it all the same, and while my internet presence isnt very high these days, I'm still around. Enjoy the short video. Last edited by crvz; 12/03/2016 at 07:09 PM. For sure! For a guy with a couple young kids tank looks great Chris! 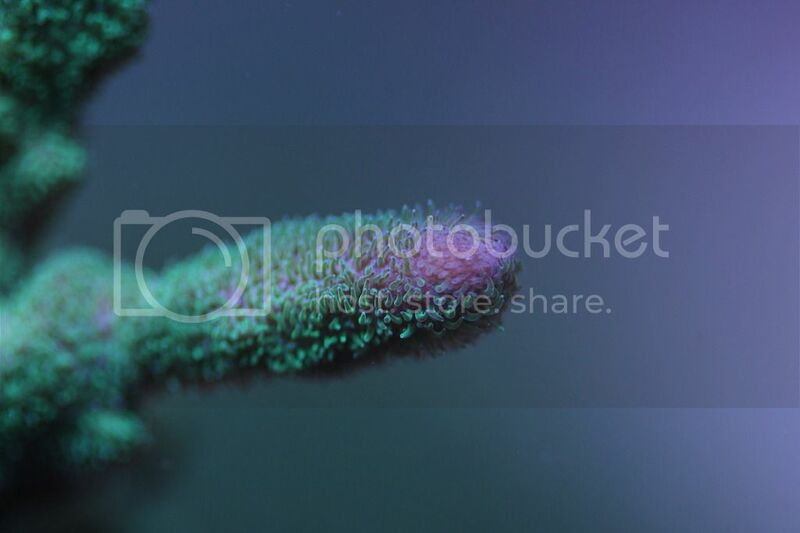 I was playing around a bit today, then grabbed the macro lens on my camera. 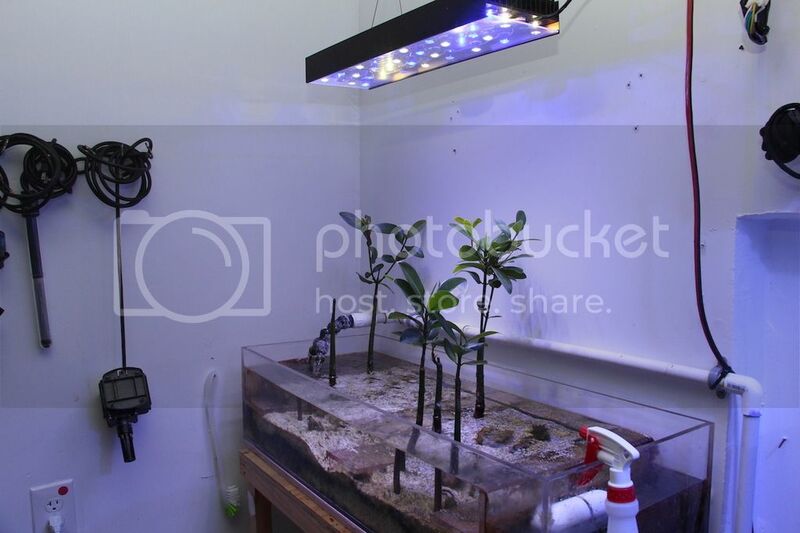 First, I changed out the light for my mangrove trees. I was using simple CF bulbs, and I measured the light at the water surface, and it registered a whopping 26 on my par meter. I put this home built LED fixture on at it was over 300 (I built this a few years ago, but didn't have it in service for a while). 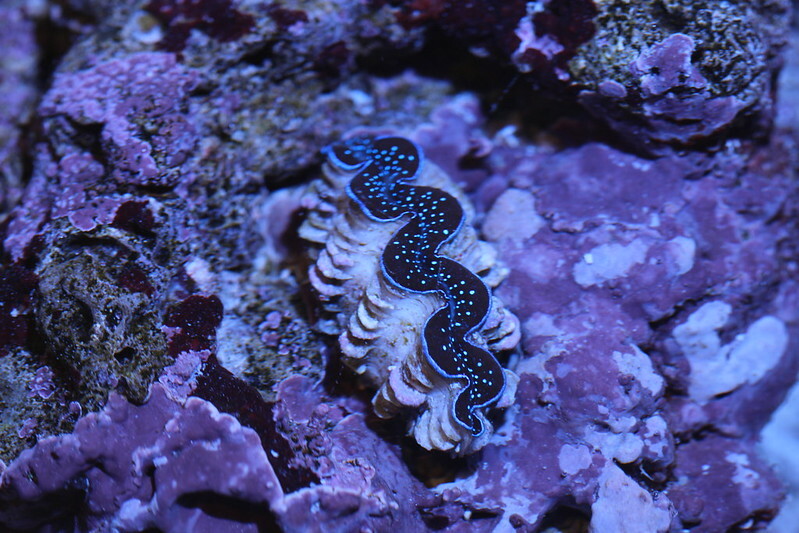 I did this as I bought a clam, had it in this little side tank for a while and it was doing fine. I put it in the display, and immediately showed pinched mantle signs. Well, turns out one of the fish nips at clams, which explains why I lost a bunch a few years ago. So I decided I'd try some in here for a while, and I wanted more light. I imagine the mangroves would have been fine regardless, but I thought the clam would appreciate more light. 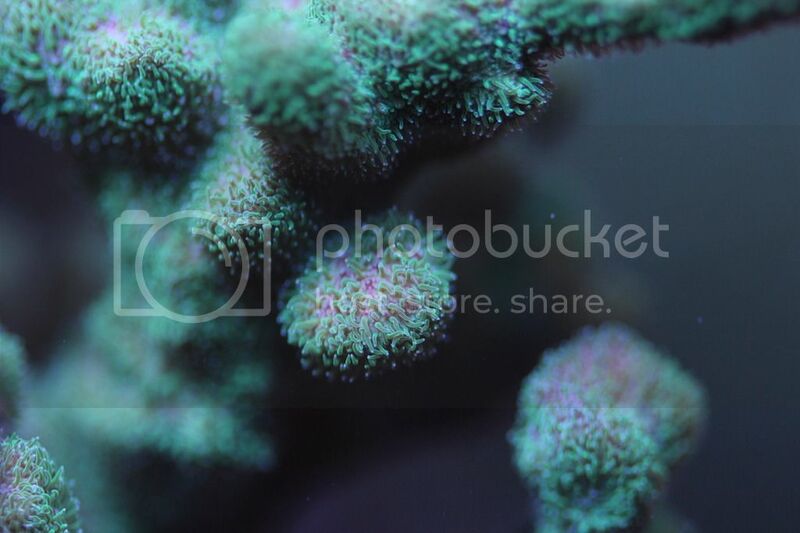 With the macro I captured a few of the SPS in the tank. 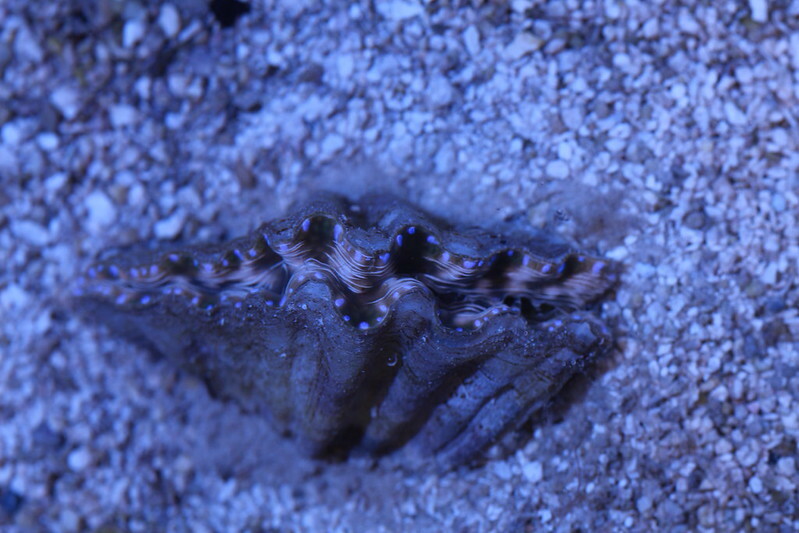 I've had this german blue polyp for years (from when you gave me a frag, Clint), and somehow it has survived all the various transitions. It's been coming around for a number of months. 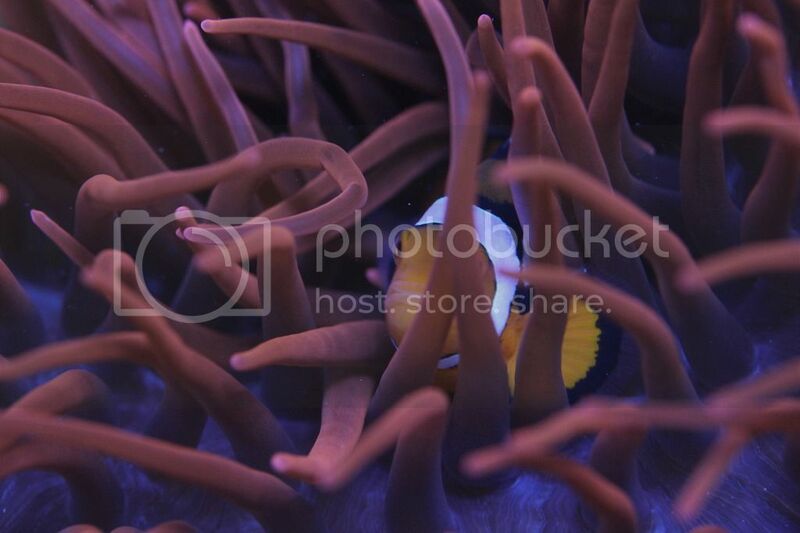 This red bubble tip anemone has split again recently. I've got four in the tank after starting with the one (again, your fault clint). I don't remember where I got this. But I like it. This is a psammacora (spelling?) species that I got I think when MACNA was in Houston. That may have been 10 years ago. But, it's held up. I've got a purple one as well. Great pictures. I really like the mangrove setup and the clam in there. Did you guys know I've still got a tank. Who would have thought? Here are a handful of comparos since I last posted. This was three years ago. 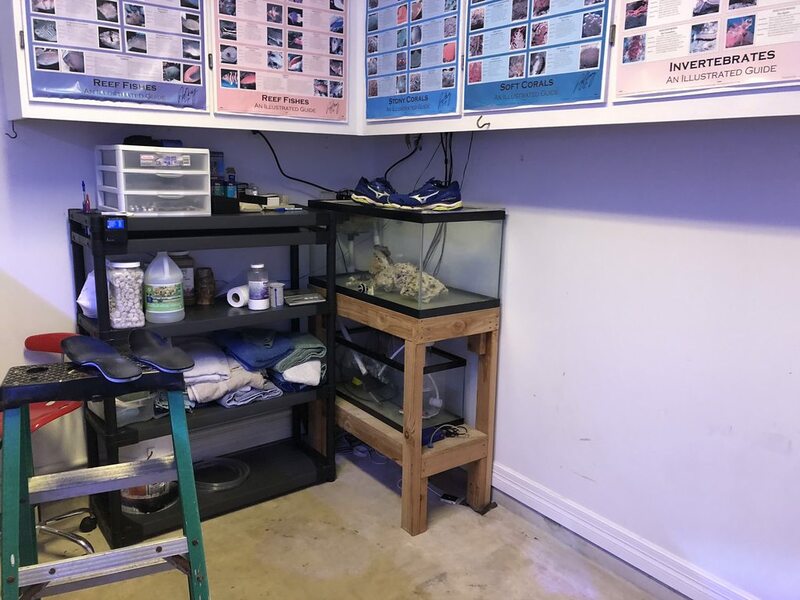 Major changes in the tank is that I've gone to the maxispect gyres as the old Tunze 6100s I had began failing (they were 12 years old and I bought them used). And a full tank shot of today. 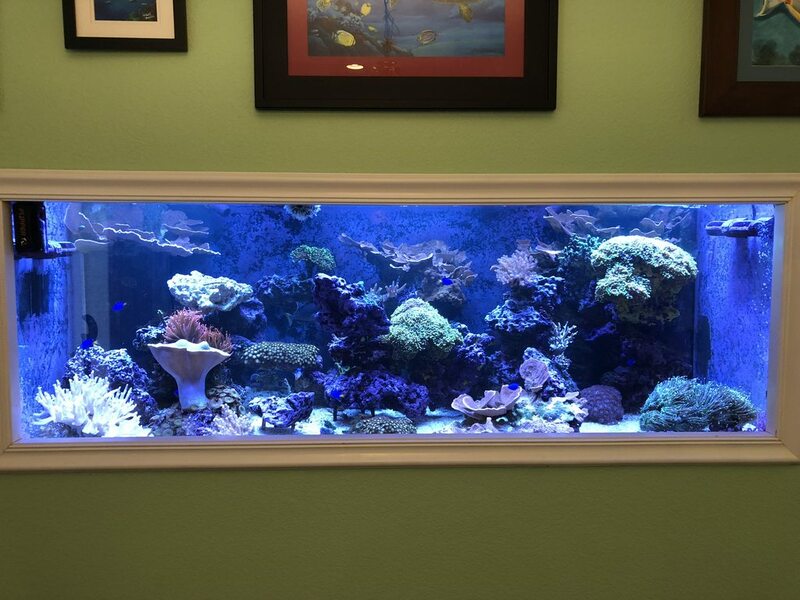 I'll follow this post with a bunch of other shots from around the tank room and things I've either replaced or upgraded. 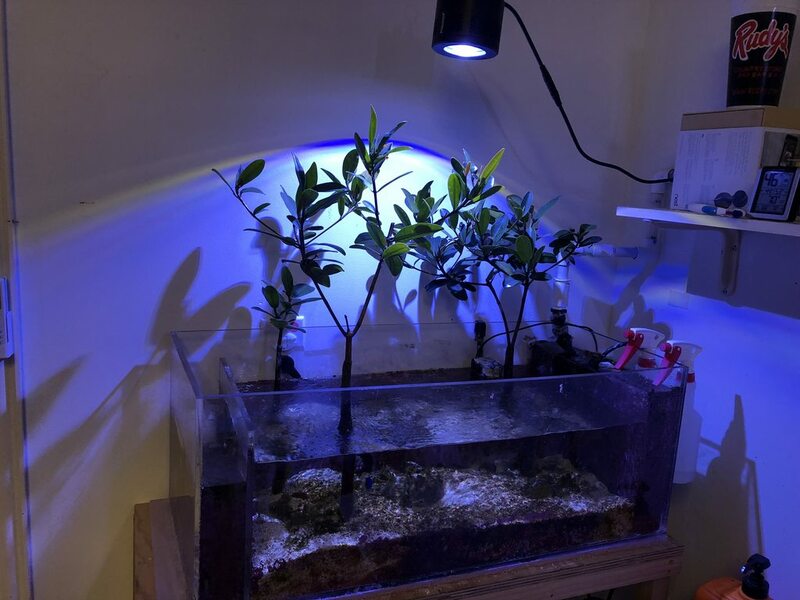 The mangrove tank from about 18 months ago vs today. 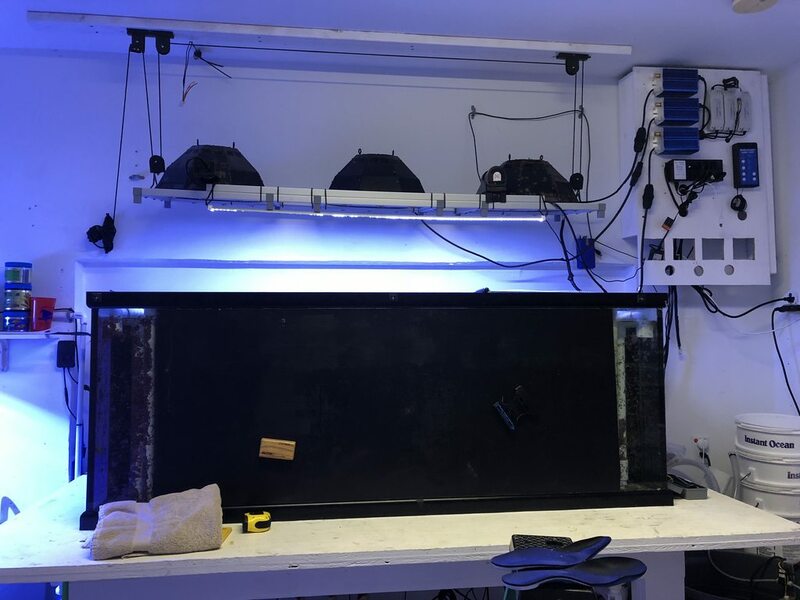 I moved it to the side of the utility sink, and the light fixture I had built (cree LEDs and mean well drivers) started failing, I think due to thermal loading, so I recently bought a Kessil 360 to light it up. You can see the mangroves are growing pretty well, I've pruned them down a few times. I turned down the Kessil brightness just for this image, it's usually on at 100%. 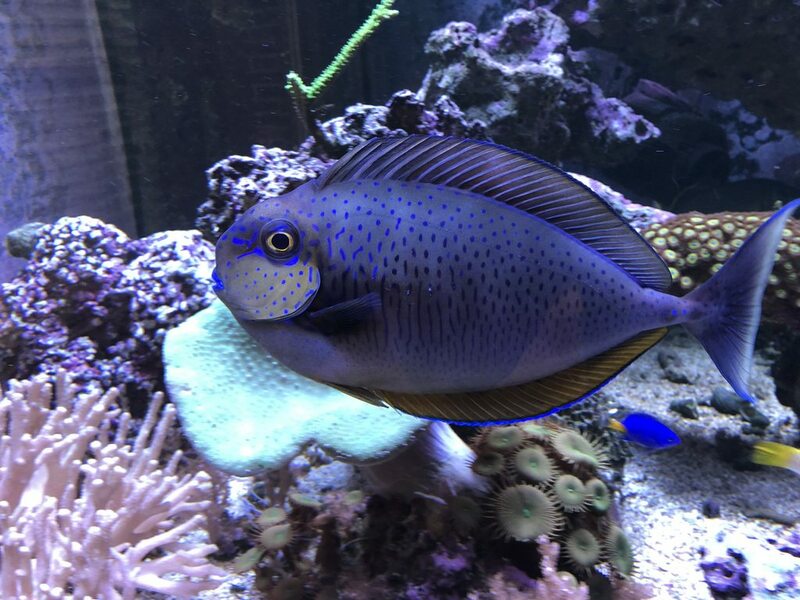 Some other shots from around the fish room. Here's the back of the tank. Major changes here are that I've had to replace all the MH ballasts (blue ballasts mounted top right) and I've redone all the electrical (went away from the home made switches and now just run Apex power strips). 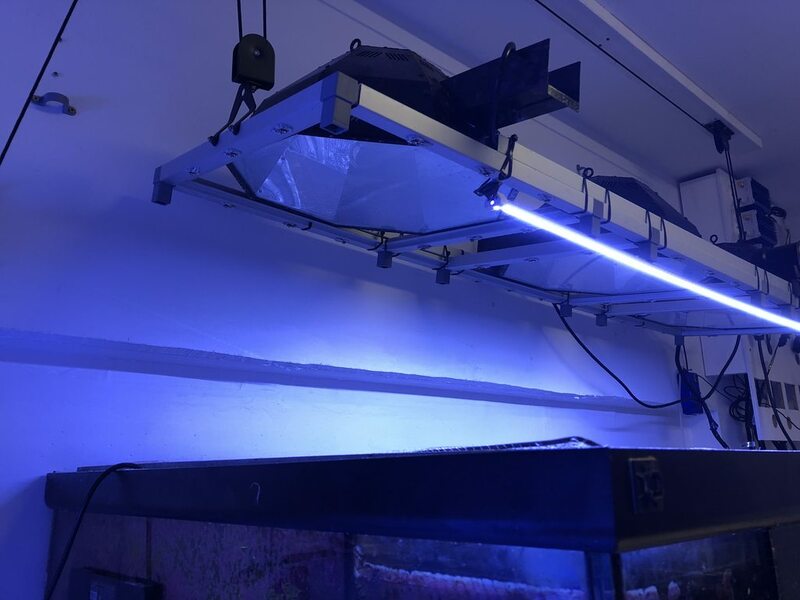 Also, much like the LED light fixture I built for the mangroves, the LEDs I used to illuminate the tank on the aluminum light rack started to fail. In lieu of trying to fix it, I decided to just run a simple LED light strip to replace it (Truelumen Pro LED 48" strip light). I might add another one down the line, but this was a much more straight forward and plug-and-play solution for running lights when the MH aren't on. The sump is basically unchanged, though I'm only running 1 return pump (instead of two). 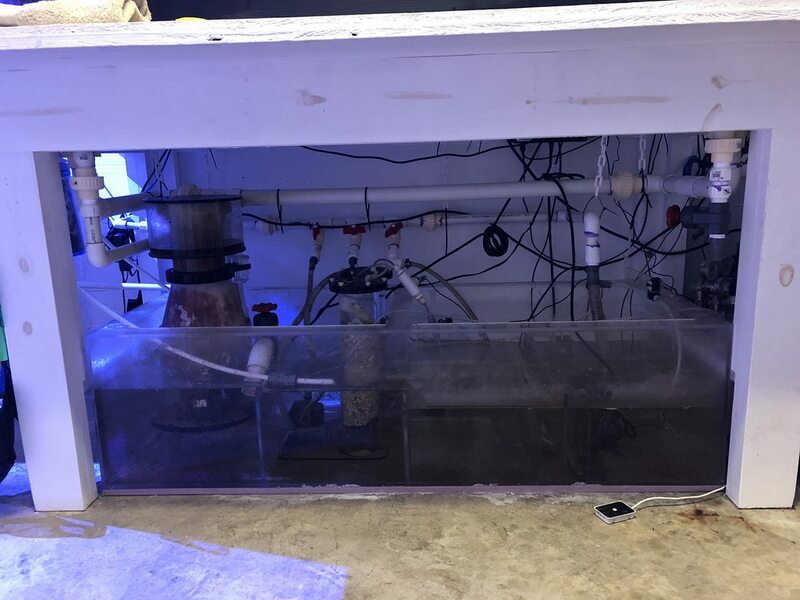 Here's the side of the display and sump, the larger brute is for water changes and the smaller has some spare live-rock in a constant state of curing. 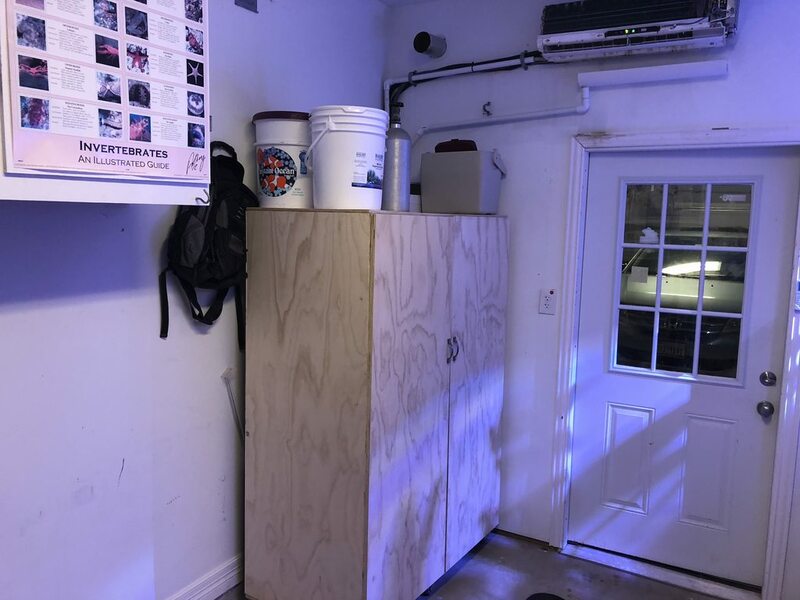 Opposite wall from the mangrove tank is just a cabinet and some open space I may use for kids bikes and scooters in days to come (hoping to add a third car to the garage). all the fish seem to be doing well. 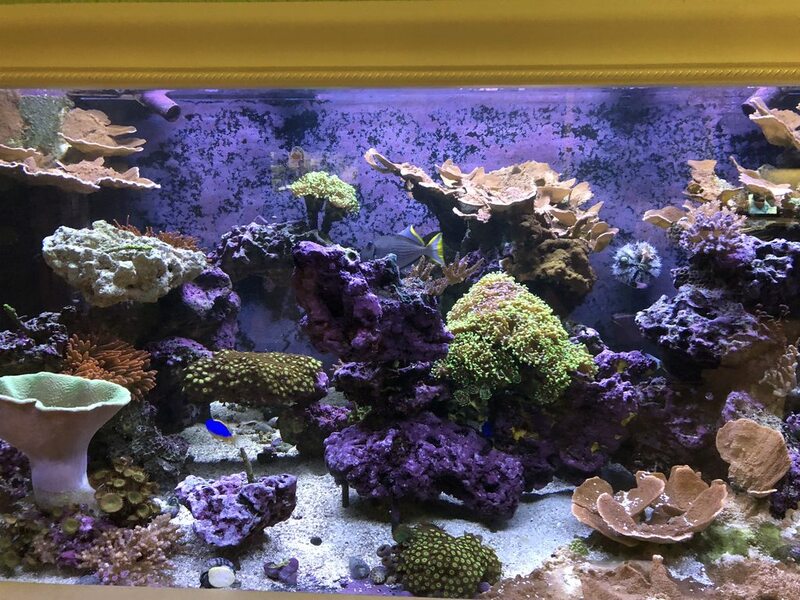 Here are a few shots of the tank this evening. Picked up this guy before. I'd never really heard about them (black backed wrasse, Anampses neoguinaicus). 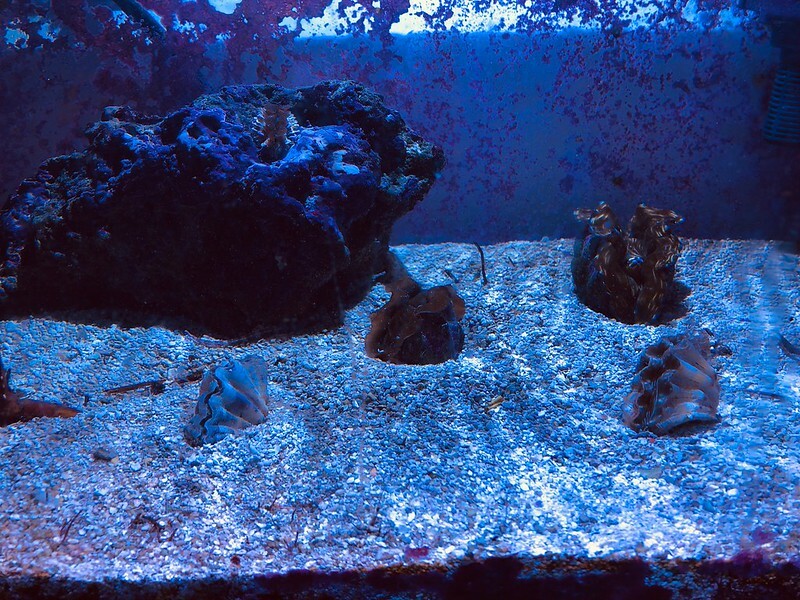 Though I'm not convinced it will be entirely reef safe, it's currently in observation in the mangrove tank. Eating frozen pretty well, hopefully it will take to its new home. I am following along this thread. Nice tank! I've had some nutrient issues... I think the mangroves and the tangs keep algae away, but corals started receding (especially the red monti cap). I let it go for months without investigating (the coral issues), but finally tested and nitrates were probably over 50ppm (maybe off scale high depending on who was reading the salifert color chart). 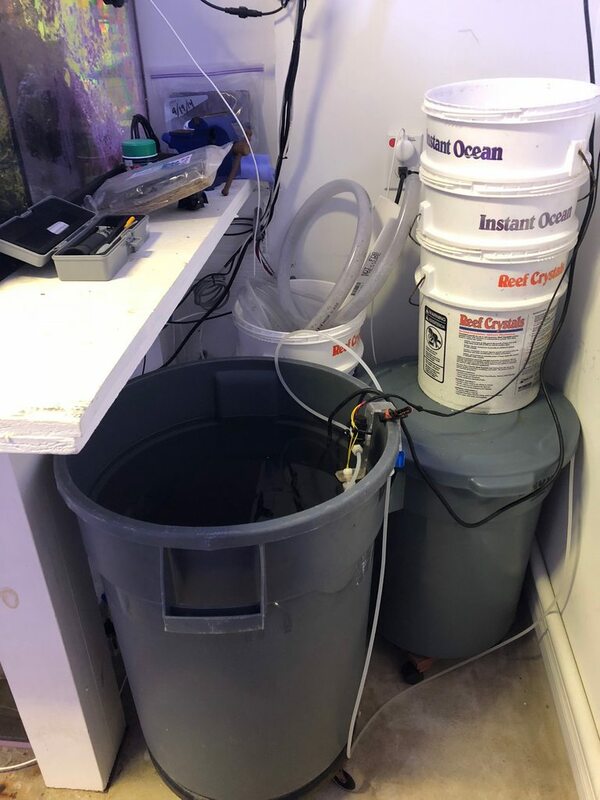 I've been doing 50 gallon water changes every 2-3 days, gotten some media for phosphate (which was 0.75), and added some carbon. 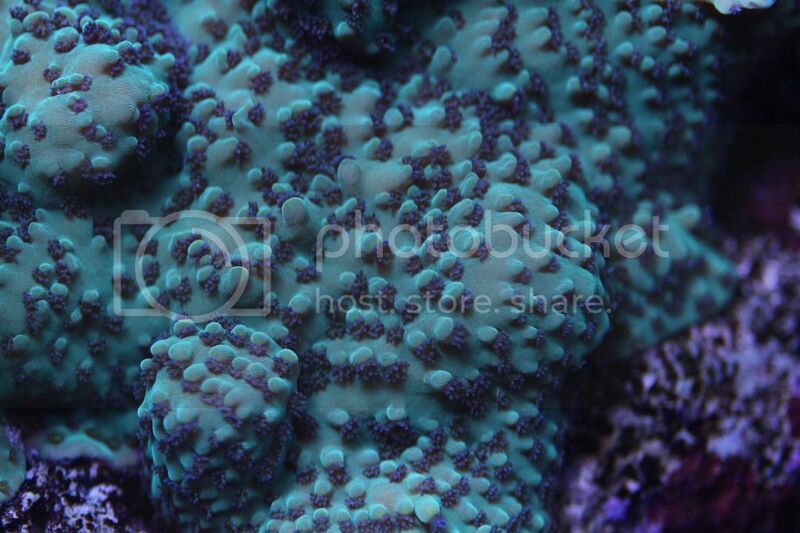 Trying to skim a little more aggressively as well, and I pulled out a lot of the dead or dying montipora. Which resulted in getting bitten by the trigger fish hiding in said coral. Whoops. Heres a today shot (without the halides on... just the LED illumination light and then the bleed through light from the mangroves on the right). 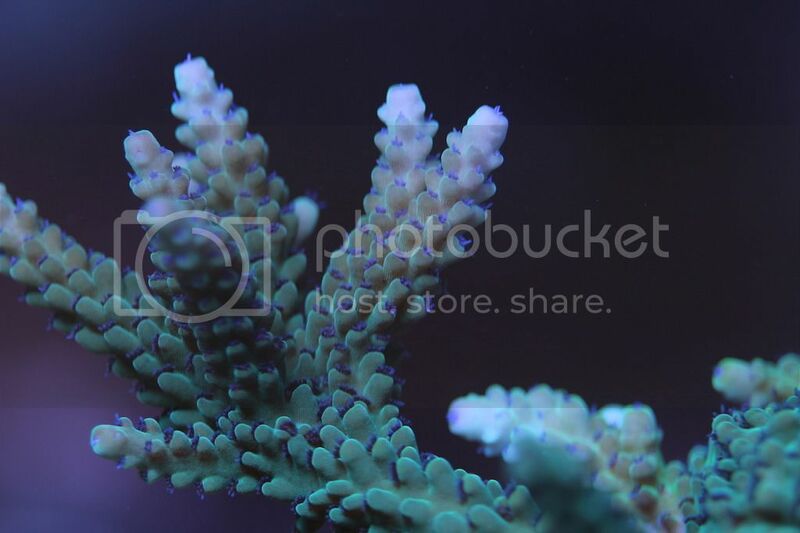 I'll keep up the maintenance and then hope to get some more stony corals in a few months. I had been working a lot around the house doing non-tank stuff for a while (woodworking projects, garage stuff, etc), but I've gotten more into the hobby a little and hopefully that will keep going. 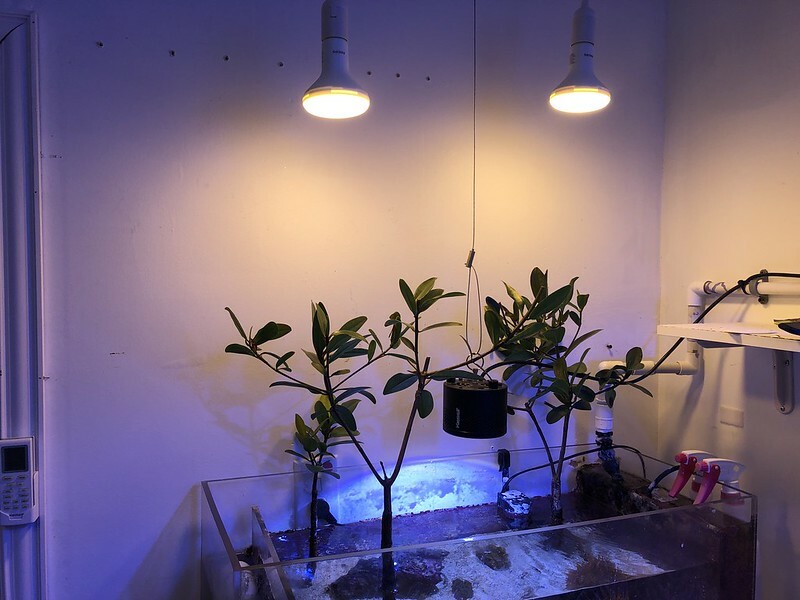 Also on the mangroves, I've added a few flood lights (though I've already changed these bulbs) and lowered the Kessil LED down for a few new clams. I like clams a lot, though I had a number of them die a few years ago (three of which were around 8"). I'm going to try again in this side tank. I also got two hippopus, simply because they were cheap and I've never tried them before. We'll see how it goes, there hasn't been great availability online for clams that I've seen these last few weeks. 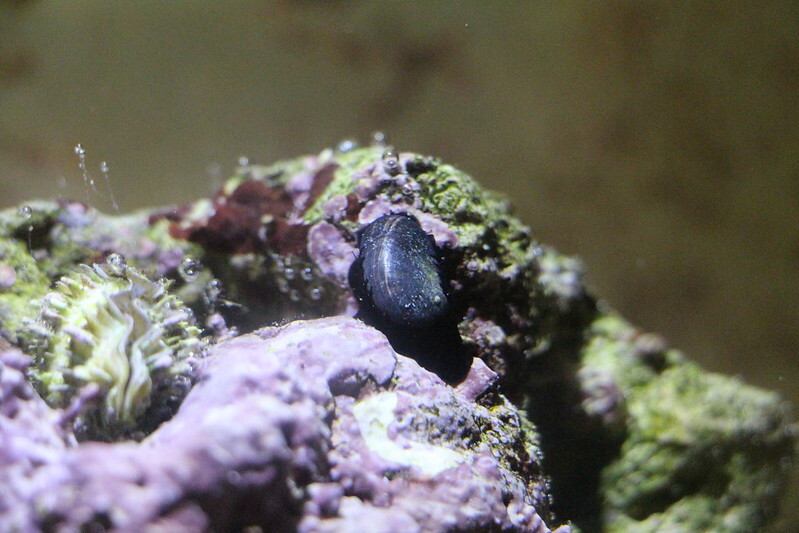 I also found this black shelled snail in the tank. I don't trust it. Glad to see you are getting things back in gear! Love the clams. I am doing the same. I just finished testing every parameter in two of my tanks. How long have you had the ones in the satelite tank? The two derasa have been in there a couple months, but the hippopus and maxima are new additions. I would like to find a few squamosa, but I don’t know if the general cold throughout the US is slowing imports or what, as I haven’t found anything for a while. Aside from spendy blue ones, which I might be dumb enough to try.